The best way to create a solid real estate investment and minimize repairs is to conduct an extensive renovation. A comprehensive rehab will ensure that you can maximize your monthly rental income, instead of spending it on repairs. Additionally, this will create a great rental home for your tenant. Roof – The roof of your property is an essential structural component of your property, so be sure to have it inspected. If your rental property roof has around 20 years of life remaining, it likely does not need to be replaced. However, if your contractor suggests a new roof, spend the money and create a solid investment. Here’s a video on how to determine when to replace the roof on your rental property. Windows – Fully functioning windows are incredibly important for the overall condition of your property. Most times, we will purchase white, vinyl windows that contribute to the insulation of the property. This is great news for your tenants because it will keep them comfortable, as well as keep their utility bill low! A couple of brand suggestions are Anderson and Pella. Electrical – We typically install 200 amp electrical panels on our rental properties. Running new electrical components will future-proof your house! Additionally, doing so is not much more expensive than purchasing a 100-amp panel. Plumbing – We tend to remove old galvanized pipes and PVC. A better alternative is PEX plumbing—for multiple reasons, including it’s durability in cold weather. Furnace – A new furnace will last 10-15 years, and supply your tenant with reliable heat. Water heater – A brand new water heater is fairly inexpensive when it comes to this list. Additionally, most new water heaters will come with a 10-year manufacturer’s warranty. 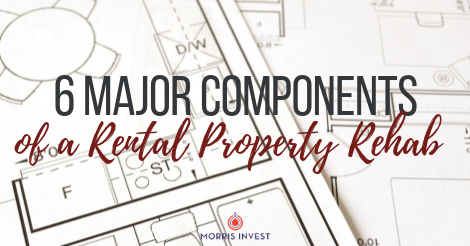 Replacing all of these main mechanicals in your rental property will set you up for a rock solid investment for years to come, minimize your repairs, and keep your costs low in coming years!